I have a hard time figuring out how to celebrate Sarah's birthday. She's young and her birthday is so close to Christmas that honestly it's easier to just not make a big deal. But we have started a small tradition that Sarah and I have a girls day with her "Aunts", Cam, Susan, and Steffanie. Last year we took her to her first movie together. (Daddy and Cody came too, we went to The Muppets Movie.) This year we decided to take her to Sweet and Sassy for a princess make over. Then we were going to go to the Bartlett Christmas parade and let her meet all of Steffanie's color guard girls but it got rained out. So we decided to take her to the movie Rise of the Guardians. Sarah is so funny, when I told her we weren't going to the parade we were going to a movie instead she said, "Oh I'm so excited! I love movies! Movies are my favorite." Aside from her 2nd birthday party (see above) the only other movie I've taken her to was Brave. 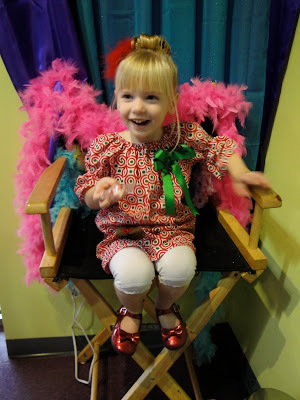 I think from now on we'll definitely keep the movie part of the tradition going and probably dump the Sweet and Sassy part of the makeover since the place is covered in feathers and Auntie Steffanie is deathly allergic. Though, I think between the 4 of us we could give Sarah her a pretty good princess makeover if that's what she wants. Sarah was so excited about her princess make over. She was ear to ear grinning and it was her real genuine smile not her goofy cheese smile she gives me now every time I get the camera. For her makeover they painted her nails, she picked pink, and gave her a tattoo on her hand. 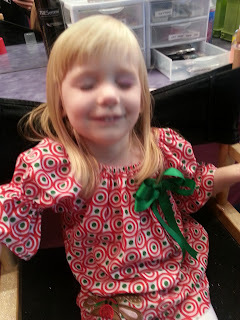 Then they put eyeshadow on her, again she picked pink. 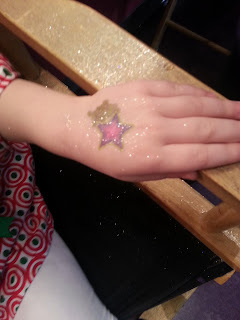 When they said she'd get a "glittery make up application" I thought it would be like face painting. 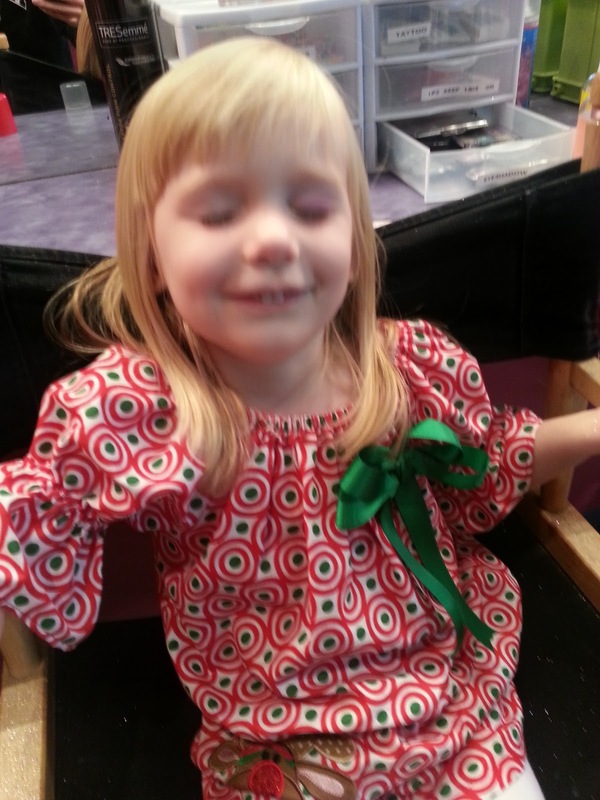 So when they got out real eyeshadow compacts and let her pick I was a little surprised. She giggled the whole time and said it was tickling her. They also gave her glittery stars on her face. It rubbed off pretty quickly so Auntie Susan took her back inside after the movie (we carpooled over to the theater). 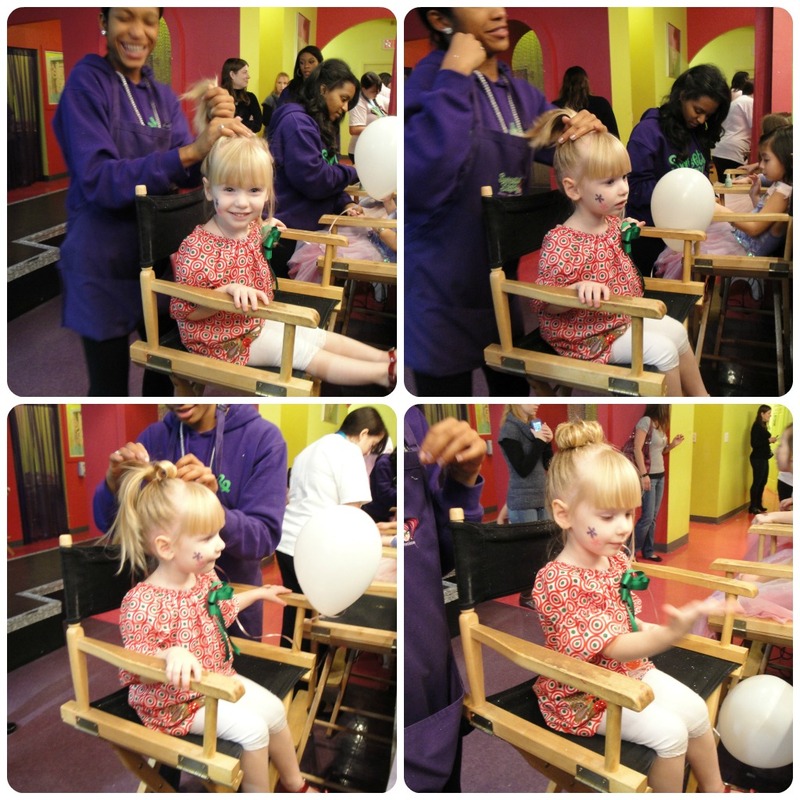 And the best part was they gave her a princess updo. I watched carefully and think I can recreate it. It seemed simple enough and Sarah really liked it so she might be willing to let me do it. I love letting Sweet and Sassy do Sarah's hair, when they are done they spray it with glitter and cupcake scented spary. She smells so good for the next day. After that it was off to the movies! Sarah loved the movie, but if I'm a little worried that the bad guy, Pitch Black the Boogie Man, will reappear in play time. She's been acting out what she sees in cartoons recently. 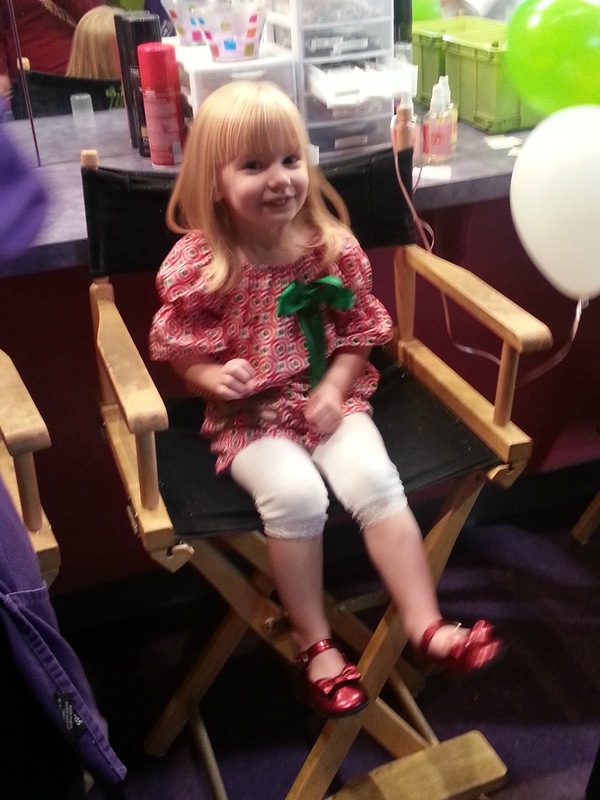 Sarah had a great time cuddling with her Aunts and snacking on popcorn during the movie. Mommy's big gift to her was to actually let her eat the ring pop they gave her after her make over. It was her first sucker ever. It made the sticky mess that I knew it would. I think Auntie Susan was especially glad she had just gone to Auntie Cam's lap before I gave her the sucker. Ha! 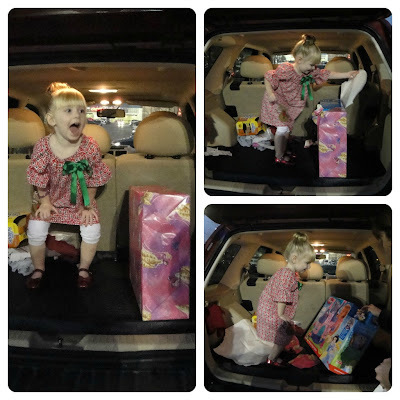 Then it was back to the car to open the present Auntie Cam has been waiting to give Sarah since this summer. She got her the Little People Singing Princess Castle. And Sarah loves it! Cody loves it too. That's causing some play time issues right now. Sarah doesn't want to share her new toy just yet. Whenever I get home from doing something with these ladies Chris is always quick to say, "You've got some really good friends." And I know that I do. They adore Sarah and she loves them to pieces. I'm looking forward to our girl day/movie date every year for Sarah's birthday. Moral of the story: Aunt Cam, Steff, and Susan are AWESOME!! !